Click on your start menu and type the words “ease of use” into the search box, and then press return. You will find a section called Ease of Access Center. In this area scroll all the way down to the bottom and find a section called “Make it easier to focus on Tasks”. Click on this you’ll be taken a new screen. Go to the bottom of this screen and find the section called “Make it easier to manage windows”. 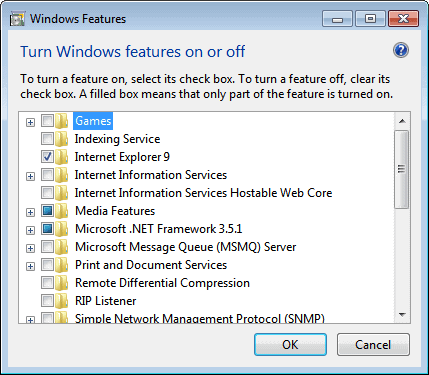 Uncheck the box that prevents windows from being automatically arranged when moved to the edge. This will give you a small increase in performance. Please note that you cannot move windows to the edge of the screen anymore to automatically arrange them afterwards. Now go to your start menu again and type, “turn off features” into the search box. This will give you a search result called “Turn Windows features on or off”. 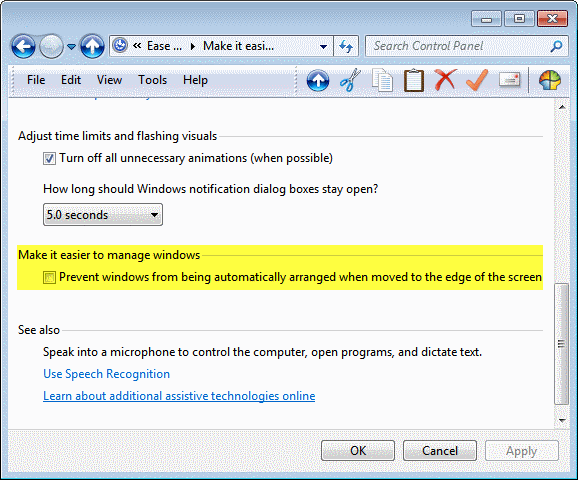 Click on this and this will take you to an area that will enable or disable certain windows features. Disable anything you don’t need, such as games. It’s really up to you what you need and don’t need, so go down the list and decide what you use. If unsure, leave it enabled. Chances are you’ll find a few things to turn off, and that will free up resources in Windows. Go back to your search from the start menu and type “uac”. 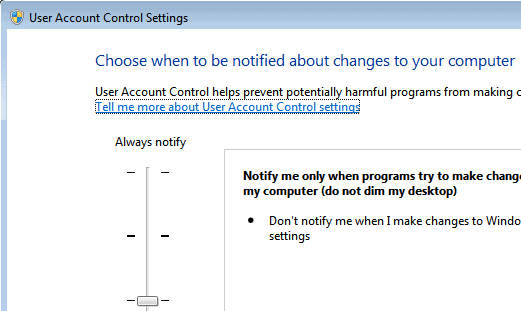 This will enable you to change user account control settings. There will be a sliding bar that controls how often you are notified about changes to your computer. If you’re not worried about messages and are happy to let your computer manage itself, slide the bar all the way to “never notify”. This means you’ll get fewer messages, it will be less annoying, and you’ll boost your performance slightly. Now go to your start menu and right-click on “Computer”. You’ll get a sub-menu where you can then click on “manage”. In here, click on “services and applications”, and then on “services”. In services you have a number of different things, which can be turned on and off automatically on startup. 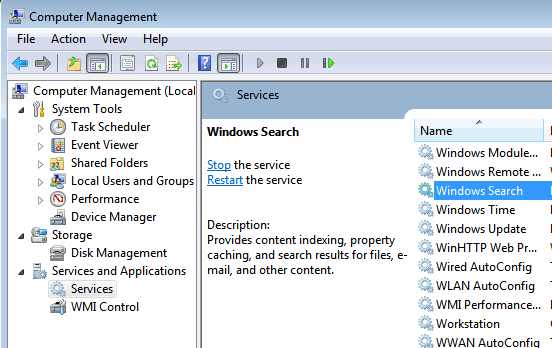 Most things in here should be left alone, but one feature called “windows search” can take up a lot of resources. This is the indexing feature of windows. You can double click on this and choose “disabled” from the drop down list. This will help improve your computer’s performance, because Windows won’t be indexing every file from now on. Of course, you can always turn it back on again if you wish later. These are just a few things you can do to help boost your computer’s performance with very little effort. The article above was written with enhancing performance in mind. It offers a few suggestions on how, by freeing up resources and turning off unwanted Windows 7 features, small gains in performance can be achieved. Naturally, different people use their computers in different ways, and some users have varying levels of technical expertise. It’s always advised that if you are unsure about changing settings then you should leave well enough alone. This is no “one size fits all” when it comes to settings customization. You should enable or disable services and features dependent on what you feel is right for you. For example, turning off indexing will certainly increase performance – but if you need indexing, don’t turn it off. Many experienced users don’t need some of the features mentioned above and can safely disable them, and that’s why they are specifically mentioned. Disabling services and turning off unused features will always increase performance, however little that performance gain may be. You may decide that some of these gains are undetectable on very fast computers. Update 2: Disabling UAC is something that only experienced users should do, as it can impact the system's security. Turn off UAC? Why don’t you use XP?UAC doesn’t make your system slower, it makes it more secure. Why not using 640×480 resolution? Users DON’T change UAC settings, they are here for your security. These “annoying messages” tell you that something important is happening! I’d guess that most users click ok or whatever comes up to continue their work without really reading what the prompt says. Martin, even when they click “ok” programs can’t change system folders by themselves. Turning of UAC doesn’t bring you more performance, it’s plain stupid. Mark you are right, but my argument was not for turning off UAC to gain performance, only that the security measure is less effective due to users clicking ok without understanding or reading what they allow by that. UAC makes noithing slower, it makes Windows the most secure Operating System. 15 years of experience? of what? making Windows slower and unsecure? I was about to turn off “Windows Media Center” and “Windows DVD Maker”, but when i unchecked the boxes, it notified me that turning these off could affect other programs. I assume they offer basic services that other programs may rely on. Any idea what services actually get turned off when turning off these features? Also, does turning off “internet explorer” actually uninstall IE? Or does it just disable some services? This is a terrible guide. Turn off UAC? Really? Turn off the thing that makes W7 super secure? Really? This is moronic and you shouldnt be encouraging average users to goof around with sensitive system settings, especially UAC (security). Next youll be posting links for apps that “help speed up your system”. Im convinced your 15 years of experience is really just 15 years of “being around or near a computer”, because what youre asking people to do is dumb and wont speed up your system in any way. wow, UAC being disabled isn’t really a performance enhancer, it’s more like having a window open in your house to invite bugs in. search indexer, registry cleaner, defragmentation (automatically), Remove the freaking toolbars that track movements are a few good things to take care of… this guys experience is terribad. I wish there were some proofs about registry “cleaning” and system performance, never seen any.. I see absolutely no use for the UAC . As soon as I got Windows 7, I turned it off, The same with all my family’s computers. It’s the single most annoying thing about Vista/7. Use common sense, an adblocker, Noscript, and a free antivirus to protect you from threats. I’ve had my computer for 6 years, and never once has it become infected. These are well known “tweaks”. Only disabling services could have an effect on performance. But as you said these are highly user orientated and you can’t just say disable these for faster pc! If you don’t need something e.g. windows search disable it. But keep everything you need if you have enough memory! Some even say disabling services might have a negative impact on system performance on windows 7. And speaking of disabling UAC for performance gain is just typical “tweak”. If you find it annoying and time consuming to click “ok” disable it for “faster” working with pc. I myself had enough of prompts and I trust my antivirus and firewall so I disabled it. If you write about “tweaking” of system please consider also to ad the facts of them! Mostly tweaks are just rumors and false just for this kind of articles..
whilst you’re at it, why not remove all NTFS permissions on the system drive, turn off the firewall, windows updates, give the administrator a blank password, and turn off windows defender. you’ll get a really fast pc….. oh, until you get a crap load of malware installed on your pc, probably the result of drive-by ads on ghacks.net. the irony! Adjust visual effects for performance. As many of disk defragmenters uses it for optimizing file locations on hard drive.. Since when do disabling icons and removing the desktop wallpaper help in speeding up a computer? on start up windows doesn’t need to load icons and desktop wallpaper to memory but these are only noticeable on extreme low performance pc like netbooks, but it only affects on windows launch time. When You use 12 years old PIII 900MHz with 128MB RAM You will notice significant drop in performance whenever desktop is shown and both wallpapers and desktop icons use those limited resources to be redrawed. I have to agree with everyone else. This article offers some very bad advice. Disabling Windows Search will mean that whenever you want to search for files, it now takes 100x longer to find them. Absolutely ridiculous! so not that ridiculous is it? I was about to go off about turning UAC off but I see others have. I’m a MCITP CST/EST do not listen to this idiot leave UAC on!!!!! That’s BS, the UAC is the single most annoying thing about Vista/7. Like I said in a previous comment, use common sense, an adblocker, Noscript, and a free antivirus to protect you from threats. I turned UAC off in all of my family’s computers, and they’ve never been infected by a computer virus. My computer has never had one either. The FIRST thing I do when working on a Windows 7 machine is turn off UAC. It does nothing to increase security unless one is an Administrator on a network and don’t want users installing a bunch of crapware. I’m assuming users also turn off Windows Firewall as well and use one that is worthy of the name “Firewall.” May as well pop off indexing as well–worthless tool if one is using something like Everything. My gosh! I must turn off or disable over 30 items when working on a fresh Windows 7 install–from UAC to numerous services. Do some homework; come back later (three months should suffice) and tell readers you’ve changed your mind, yes? To all those people who say turning uac off is bad its not, only people who dont know how to stay safe on the internet use it. Or to put it another way all the people who go downloading files and clicking links without knowing how authentic they are are just asking for trouble. UAC is a noob feature to keep inexperienced people safe. I cannot agree more with the rest of the people commenting here. Press F8 before booting and select “Safe mode with Networking” now all the stuff that is slowing your computer down is turned off! And you still have Internet! I was under the impression that Ghacks was a site intended for experienced users (the clue is in the name) or those wishing to learn more about customizing their systems. Anyone who has got this far should already be aware of the possible pitfalls of tweaking the system. I do all of these without problems….. There are plenty of search apps available which are faster than Windows even with the indexer turned on. Turning off UAC is a matter of preference or opinion for experienced users. Assuming the right to call someone an idiot based on your IT qualifications is pure arrogance. That said, a warning should be attached to any article advocating turning it off. Removing these programs only disables their integration with the system, it does not uninstall them. If you have problems after removing them just turn them back on. To completely remove them you can take a look at RT Se7en Lite (for experienced users only). Gosh, I’m really disappointed to read some of the comments here. One of the first things I do to a computer is to turn of the wretched UAC. I thought everyone did that. Turn off the damn firewall too as it’s next to useless compared to even a third party firewall that is usually free. Disabling the windows search is a no-brainer too. Does anyone with any IT knowledge at all really use it? It’s mainly there for noobs who don’t know their way around a system. I can’t believe the people here calling the author an idiot. Like Isys said, that’s just pure arrogance. I’m glad I don’t employ Mr. MCITP no matter what time zones he’s in.